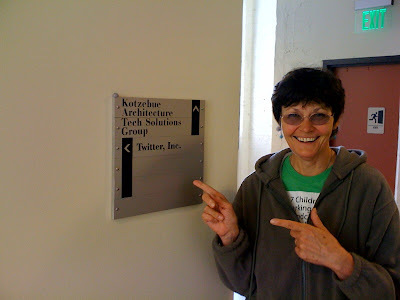 A couple of days ago I visited Twitter HQ in San Francisco with my wife, my son @tobycryns and his girlfriend, Lisa. I'll blog more about this visit later. In the meantime I have one pic to post. This was taken in the hallway on the 4th floor of the building where Twitter is based. Picture of my boss. She thinks I am so nerdy.